In Time2Track, training and work experiences are called Activities. An Activity contains details about your experience, like clients and assessments. To add an activity to Time2Track, you just need to fill in the details of what you did. Some of the fields will be “remembered” by Time2Track the next time you add an activity to make things even faster. Enter the details of your activity. If your program is using Online Approval, you’ll see additional fields for Placement and Supervisor. Your supervisor will default to the preferred supervisor you chose when you added your placement, but you can change it for individual activities if needed. Enter your hours in decimal format. For example, 15 minutes is .25, 30 minutes is .5, and 45 minutes is .75. Click Add or Add & Enter Another. It can sometimes be very difficult to choose only one activity type for a particular activity, especially if it's something you don't do often. You should always choose the activity type that best describes your experience, and this decision is ultimately up to you and your training director or supervisor. If in doubt, you can always add your own custom activity types. Time2Track has preloaded activity type lists for different levels and fields of study. 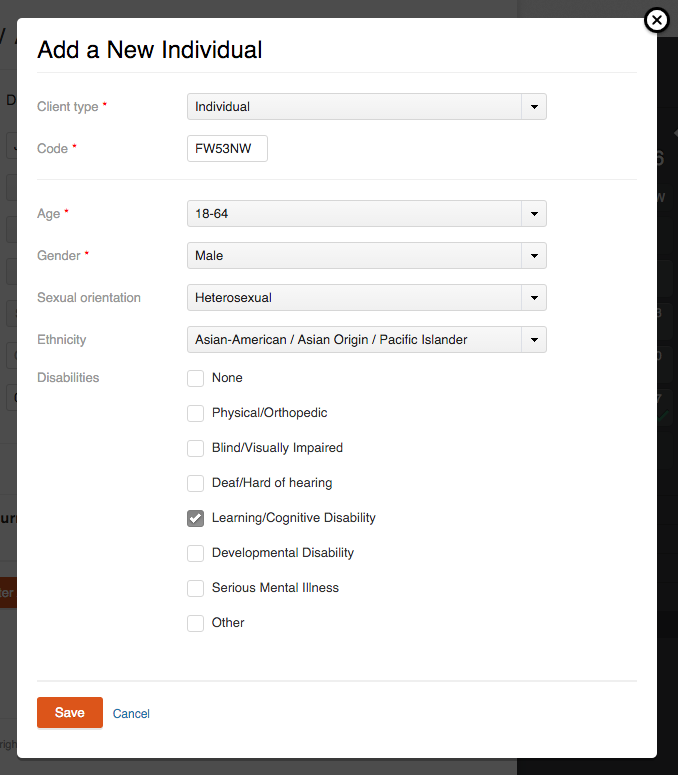 For example, if you're a student who will be applying for internship through APPIC, your activity type list will be specific to the AAPI. If you're a masters level Counseling student, your activity type list will be different. Schools and organizations can also create custom activity type lists for individuals in their programs if they prefer to track activities in a specific way. You can add a new client directly from the Add a New Activity screen. Just click Add a New Client beside the client smartsearch list, then fill out the details for your client. 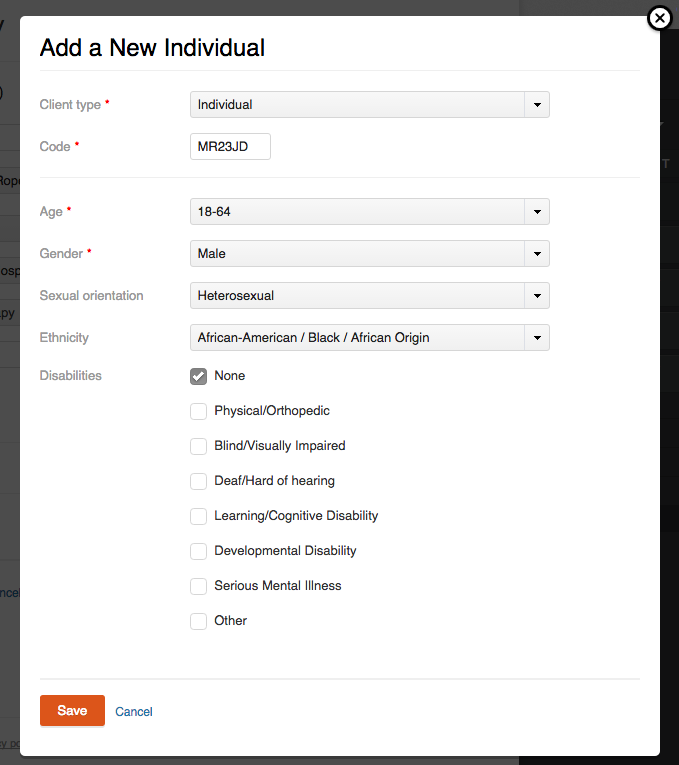 The only fields that are required are Code, Age, and Gender. All the other information is optional. 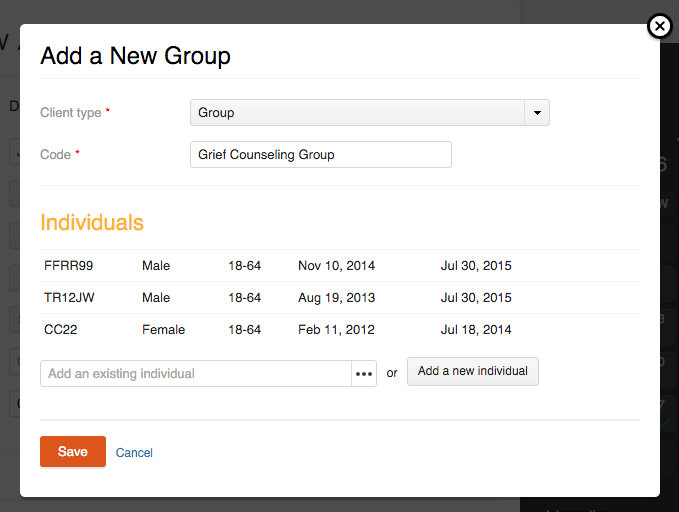 By selecting a different Client Type on this screen, you can also add Couples, Families, and Groups. 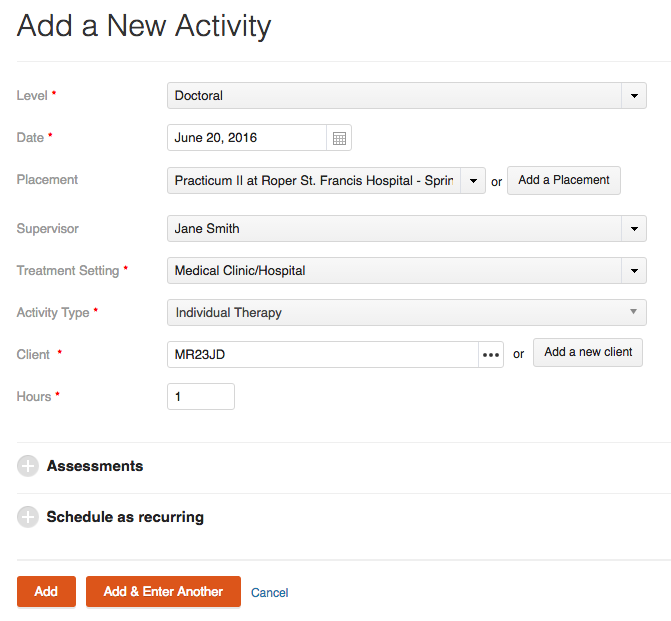 When adding an activity, click Assessments to view the options for adding administered assessments. 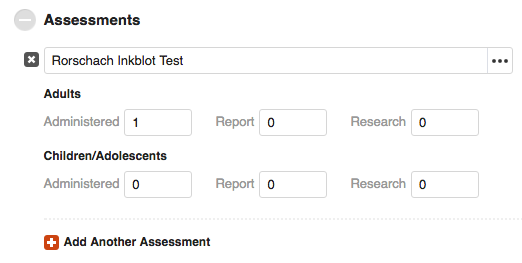 Start typing the name of the assessment you'd like to record and you will see a Smart Search list that shows all the matching assessments in Time2Track's master list. Add the number of assessments you administered (Administered), administered AND wrote a report (Report), or administered as part of a research project (Research). If your assessment doesn't show up in the smart search list, just type the full name of the assessment and record your details. Your custom assessment will be added to your list. Recurring activities are those activities that occur on a regular schedule and have the same activity details. You can also include Assessments with a recurring activity. Scheduled - Activities dated in the future. Unconfirmed - Activities dated today or in the past. This would happen when you are backlogging activities that have already taken place. Recurring activities added as Unconfirmed will not be included in your hour totals until they are marked as Confirmed. Click the Add A New Activity button. You will then be prompted to enter the details of your activity. If you are back logging hours the date should be the first date this activity occurred. Enter the remaining information for the activity. 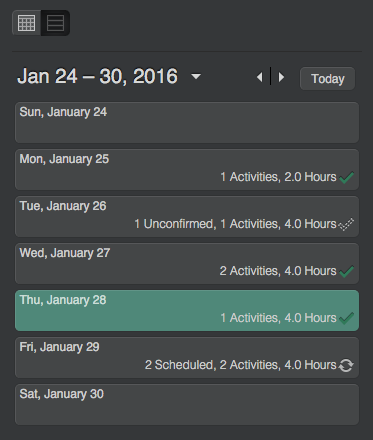 Click Schedule as recurring to view the options for recurring activities. You can choose to have the activity recur weekly or monthly. Set the end date for your recurring activity. Again, make sure the date at the beginning of the activity is the first date this activity occurred. Click Add or Add & Enter Another to save your recurring activity. When you first log in to Time2Track, you will be taken to the Activities Calendar section. The calendar on the right shows a quick view of your activities (once you've added some). Each day that contains an activity will display one of three icons. A solid check mark indicates that the activities on that day have been confirmed. A dotted check mark means there are activities on that day that have been added but are unconfirmed (they were created as part of a recurring series). A circle with arrows lets you know that an activity has been scheduled for that day in the future. Underneath the calendar you'll see hour totals for the selected month. 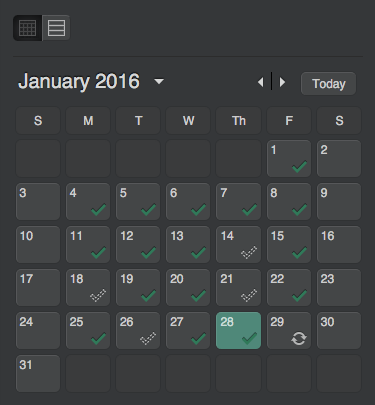 You can also click one of the two icons above the calendar to toggle between month and week views. In order to view details of the activities you have added to your calendar, click on the day the activity occurred or will occur. Move your cursor over an activity to show options to confirm an activity that has been completed or delete an activity. To edit an activity, just click the activity type for the correct listing. The Activities List section can be accessed by clicking List under Activities. You can switch back to the Calendar view by clicking Calendar under Activities. The Activity List view is a great way to find specific activities using the filtering options, and also to confirm or change groups of activities. To search for specific activities or groups of activities, use the filtering options at the top of the page. You can also click the Advanced Filters button for more options. Once you narrow down the list, you can edit individual activities, edit groups of activities, or confirm activities in bulk.